A detailed reference for the practicing engineer, Air Pollution Control Technology Handbook, Second Edition focuses on air pollution control systems and outlines the basic process engineering and cost estimation required for its design. Written by seasoned experts in the field, this book offers a fundamental understanding of the factors resulting in air pollution and covers the techniques and equations used for air pollution control. Anyone with an engineering or science background can effectively select techniques for control, review alternative design methods and equipment proposals from vendors, and initiate cost studies of control equipment using this book. This second edition of a bestseller includes new methods for designing control equipment, enhanced material on air pollution science, updates on major advances in the field, and explains the importance of a strategy for identifying the most cost-effective design. Air Pollution Control Technology Handbook, Second Edition helps combat the solution problem with extensive coverage of air pollution control processes. 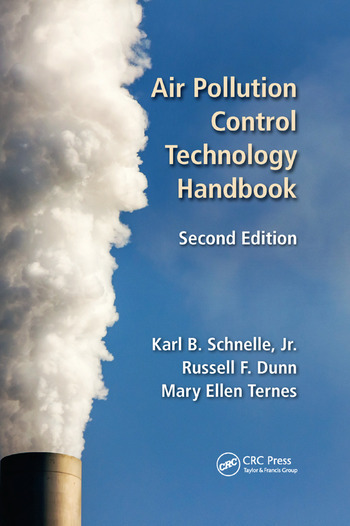 Fully updated with new legislation, air regulations, and extensive reviews of the design of control equipment, this book serves as an ideal reference for industry professionals or anyone with an engineering or science background needing a basic introduction to air pollution control equipment design. Karl B. Schnelle, Jr., Ph.D, PE, is Professor Emeritus of Chemical and Environmental Engineering, and has been a member of the Vanderbilt University faculty for more than 55 years. He has published extensively in the chemical engineering and environmental area, is an emeritus member of the American Institute of Chemical Engineers and the Air and Waste Management Association, and a Fellow of the American Institute of Chemical Engineers. He was a lecturer in the American Institute of Chemical Engineers’ continuing education program for more than 30 years, where he taught air pollution control systems design and atmospheric dispersion modeling courses. Russell F. Dunn, Ph.D, PE, is a Professor of the Practice of Chemical and Biomolecular Engineering at Vanderbilt University. He also has prior academic experience teaching chemical engineering courses at Auburn University and the Technical University of Denmark. He has authored numerous publications and presentations on chemical and environmental engineering design, in addition to having more than 30 years of professional experience. Dr. Dunn is the Founder and President of Polymer and Chemical Technologies, LLC, a company that provides chemical process and product failure analysis, in addition to developing environmental and energy-based process designs for large chemical plants. Mary Ellen Ternes, BE, Ch.E, JD, is a Director at Crowe & Dunlevy, in the law firm’s Environmental, Energy and Natural Resources Practice Group. Building on her career as a chemical engineer for U.S.EPA and industry, Ternes became a lawyer and for over 20 years, has advised clients regarding Clean Air Act permitting, compliance, enforcement and litigation. Ternes has published and lectured extensively on the Clean Air Act. She is former Chair of the American Bar Association’s Section of Environment, Energy and Resources Air Quality Committee; the Climate Change, Sustainable Development and Ecosystems Committee; and the Annual Conference on Environmental Law. "The Air Pollution Control Technology Handbook is ideal for any engineer facing an air pollution challenge. In straightforward language, it presents the information that the design engineer needs. From understanding the regulations and drivers behind them, to permitting, sampling, and modeling, this reference helps the engineer new to air pollution control problems understand what they are dealing with, why it is important, and how to assess the magnitude of the issue they are facing." "This is an excellent resource that I enthusiastically recommend for environmental and process engineers, consultants, academic researchers, and students. The highly-qualified authors provide an authoritative and comprehensive coverage of air pollution control technologies, regulations, economics, design, and practice. Written in a clear and exciting manner, the book balances the coverage of fundamentals and basic phenomena with practical experience."